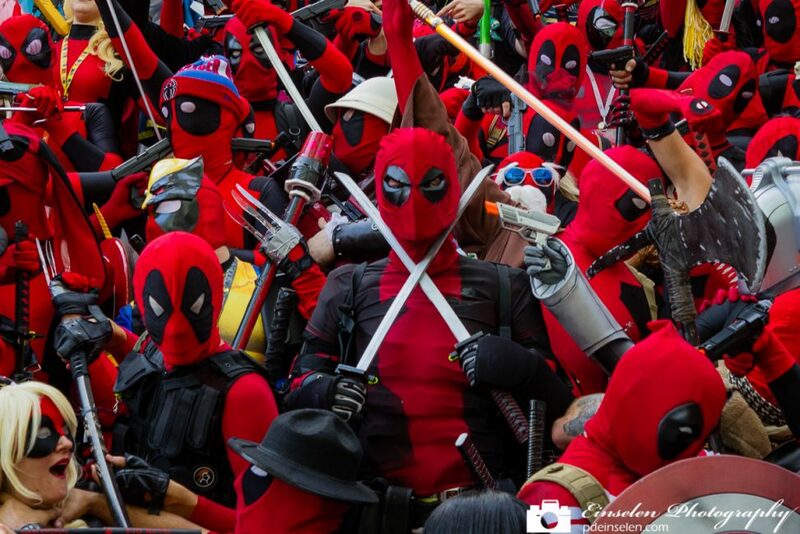 Each year at Dragon Con it is not hard to spot Deadpool in the crowd. Look left and then right and I am sure you will see at least one each way. During the event all the Deadpools congregate for a massive “family” photo. Typically shenanigans ensue before, during and after the shoot. It is a lot of fun to look at each individual Deadpool because they are so unique even acting as the same character. It was tough to choose just one photo from the shoot, however I was able to locate a Deadpool that was looking towards the cameras, mine specifically, with a pose I loved. Deadpool (real name Wade Winston Wilson) is a fictional antihero appearing in American comic books published by Marvel Comics. Created by artist/writer Rob Liefeld and writer Fabian Nicieza, the character first appeared in The New Mutants #98 (cover-dated February 1991). Initially Deadpool was depicted as a supervillain when he made his first appearance in The New Mutants and later in issues of X-Force, but later evolved into his more recognizable antiheroic persona. Deadpool is a disfigured and mentally unstable mercenary with the superhuman ability of an accelerated healing factor and physical prowess. He is known as the “Merc with a Mouth” because of his talkative nature and tendency to break the fourth wall, which is used by writers for humorous effect and running gags. The character’s popularity has seen him feature in numerous other media. In the 2004 series Cable & Deadpool, he refers to his own scarred appearance as “Ryan Reynolds crossed with a Shar Pei”, leading to Reynolds eventually portraying the character in the 2009 film X-Men Origins: Wolverine and reprising the role in the 2016 filmDeadpool. Note: This post is part of a series of photos from Dragon Con. Dragon Con is a North America multigenre convention, founded in 1987, which takes place once each year in Atlanta, Georgia.